This closer view of a brachiopod shell exterior from the same locality shows two of these horizontal borings. The mystery is why we see only half of the boring. These are apparently cylindrical borings of the Trypanites variety, but they should be enclosed on all sides as tubes. Why is half missing? It is as if the roofs have been removed. I think that is just what happened. This encrusted and bored brachiopod, again from the same locality, gives us clues as to what likely happened. Here we see an encrusting bryozoan and those borings together. 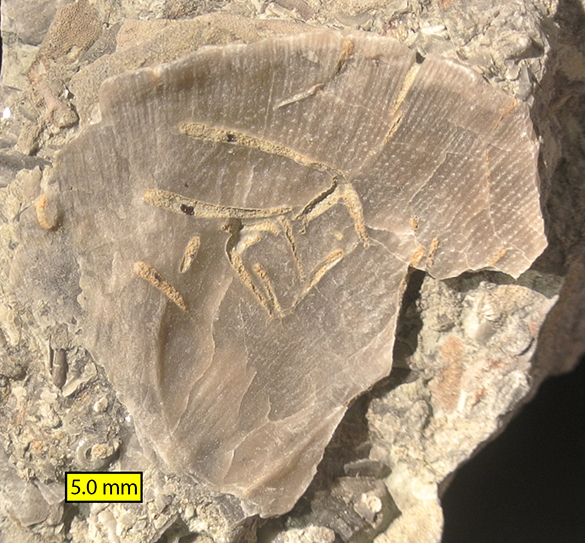 The borings cut through the bryozoan down into the brachiopod shell. Could it be that encrusting bryozoans provided the other half of the borings? Here’s a test of that idea. 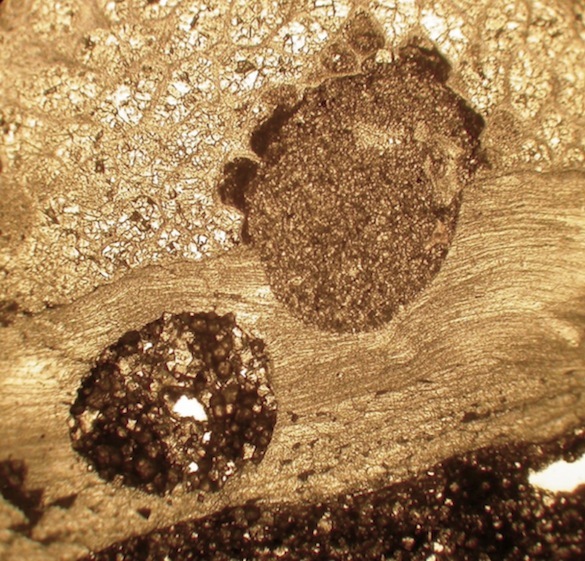 Above is a cross-section through the boundary between an encrusting bryozoan (above) and a brachiopod shell (below). It was made by cutting through the specimen, polishing it, and then making an acetate peel. The bryozoan shows the modular nature of its colonial skeleton, and the brachiopod displays its laminar shell structure. The two round features are sediment-filled borings running perpendicular to the plane of the section. 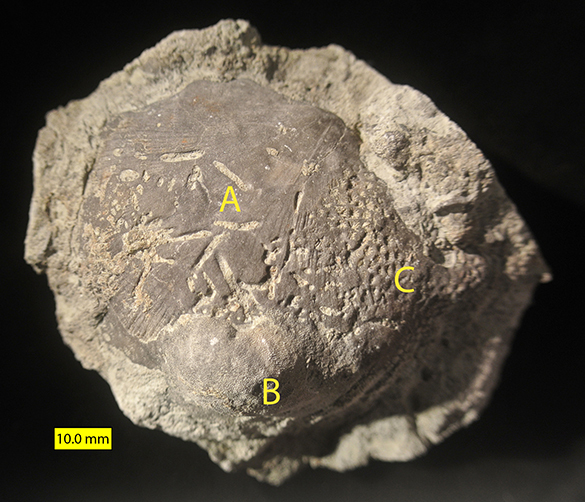 The boring on the left is completely within the brachiopod shell; the one on the right is cut along the interface of the bryozoan and brachioopod. Remove the bryozoan and we would have a half-boring as discussed above. If that postulate is true, it means that the encrusting byozoans must have been removed from the brachiopod shells, taking the other halves of the borings with them. We should thus find bryozoans that “popped” off the shells with the equivalent half-borings on their undersides. You know where this is going. 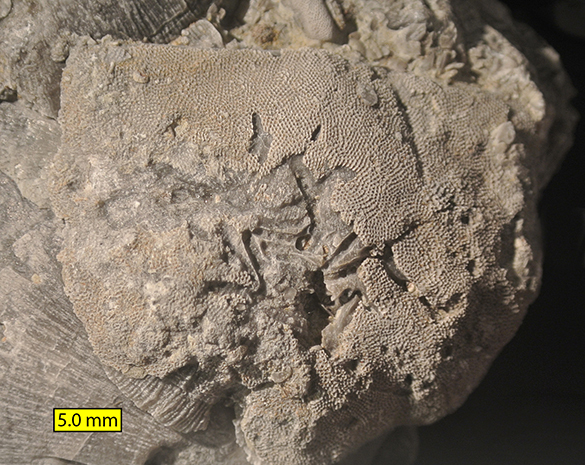 The bryozoan above (same locality) shows its upper surface. Note that there are a scattering of tiny borings punched into it. This is the underside of the bryozoan. We are looking at its flat attachment surface. It was fixed to a shell of some kind (I can’t tell what type) and became detached from it. You see the half-borings along with vertical borings drilled parallel to the attachment surface. 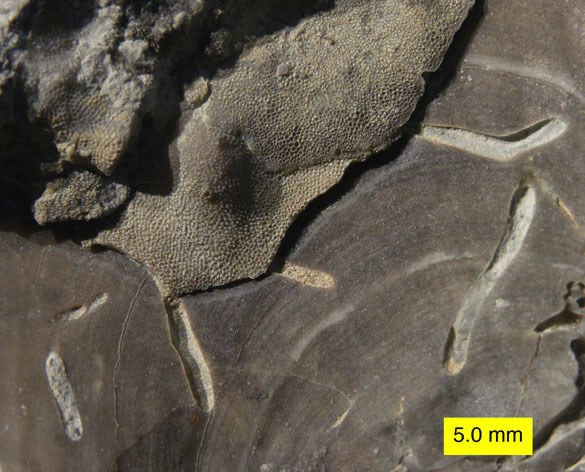 It appears that small organisms drilled into the bryozoan zoarium (colonial skeleton) on its upper surface, penetrated down to the boundary with the brachiopod shell, and then turned 90° and excavated along the boundary between brachiopod and bryozoan. This makes sense if they were creating a dwelling tube (Domichnia) that they would want surrounded by shell. Punching straight through the bryozoan and brachiopod would leave them in a tube without a base. What would this look like from the inside of the brachiopod shell? This time we’re looking at the interior of a brachiopod shell (same location) that has been exfoliated (some shell layers have been removed). The horizontal borings are visible running parallel to the shell. This view of an encrusted bivalve shell may help with the concept. In the top half you see an encrusting bryozoan. In the bottom you see bivalve shell exposed where the bryozoan has been broken away. Cutting into that shell are the horizontal borings. Their “roofs” were in the now-missing parts of the bryozoan. 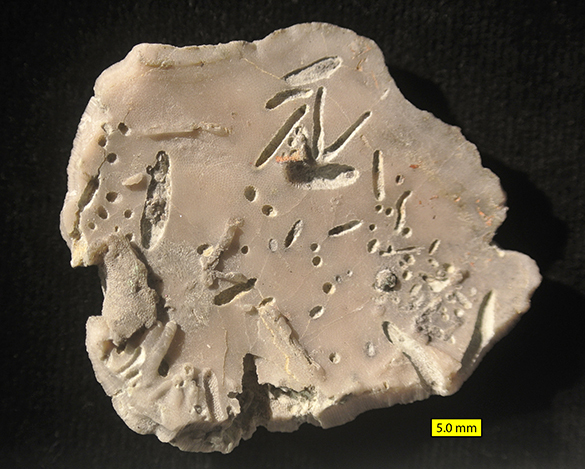 There are two conclusions from this hypothesis: (1) There was a group of borers who drilled to this interface between bryozoan and brachiopod skeleton, detected the difference in skeleton type, and then drilled horizontally to maintain the integrity of their tubes; (2) the bryozoans were cemented to the brachiopods firmly enough that the borers could mine along the interface, but later some bryozoan encrusters were removed, leaving no trace of their attachment save the half-bored brachiopod shell. This latter conclusion is disturbing. A tacit assumption of workers on the sclerobionts (hard-substrate dwellers) of brachiopods and other calcitic skeletons is that the calcitic bryozoans cemented onto them so firmly that they could not be dislodged. We could thus record how many shells are encrusted and not encrusted to derive paleoecological data about exposure time, shell orientations and the like. But if the robust bryozoans could just come off, maybe that data must be treated with more caution? 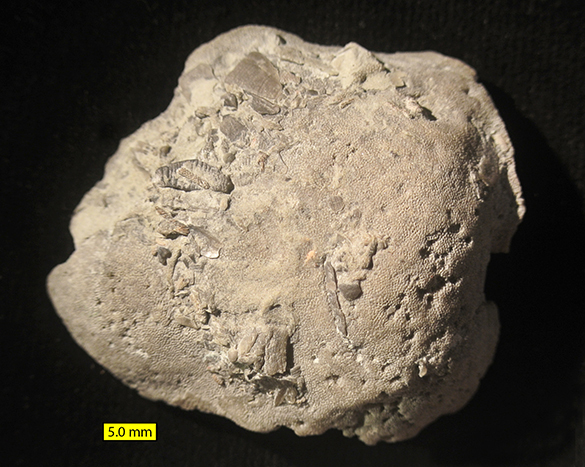 After all, bryozoans that were removed from unbored brachiopods could leave no trace at all of their former residence. Two students and I presented these ideas at a Geological Society of America meeting eight years ago (Wilson et al., 2006), but we never returned to the questions for a full study. Now a new generation of students and I have started a project on this particular phenomenon of sclerobiology. It will involve collecting more examples and carefully dissecting them to plot out the relationship between the borings and their skeletal substrates. We also want to assess the impact these observations may have on encruster studies. Watch this space a year from now! Brett, C.E., Smrecak, T., Hubbard, K.P. and Walker, S. 2012. 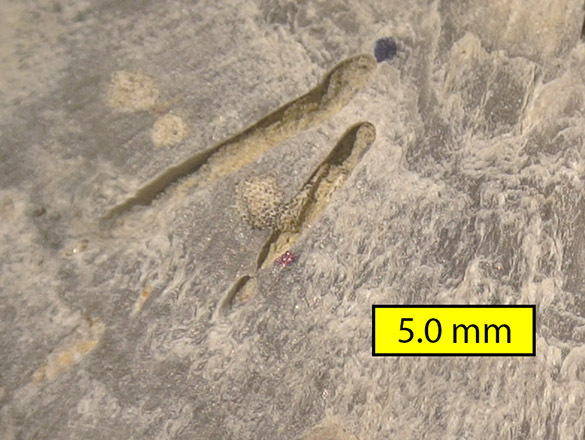 Marine sclerobiofacies: Encrusting and endolithic communities on shells through time and space, p. 129-157. In: Talent, J.A. (ed. ), Earth and Life; Springer Netherlands.